As is often the case, worker activism reached a peak just prior to the Lunar New Year, with workers desperate to get paid before the holiday. The rate of worker activism prior to New Year’s Day on 19 February was actually about double that for the remainder of the quarter, with 9.44 incidents per day compared with 4.56 incidents per day on average since 20 February. However, it is important to note that the level of post-New Year activism was still on a par with that of the fourth quarter in 2014. In the pre-New Year period, more than half (52.5 percent) of all worker protests were in the construction industry, while manufacturing accounted for 22 percent. In both industries, actions were driven overwhelmingly by the non-payment of wages. Workers blocked roads, staged sit-ins in their work places, and protested at government buildings in a bid to get paid. One week before the New Year. 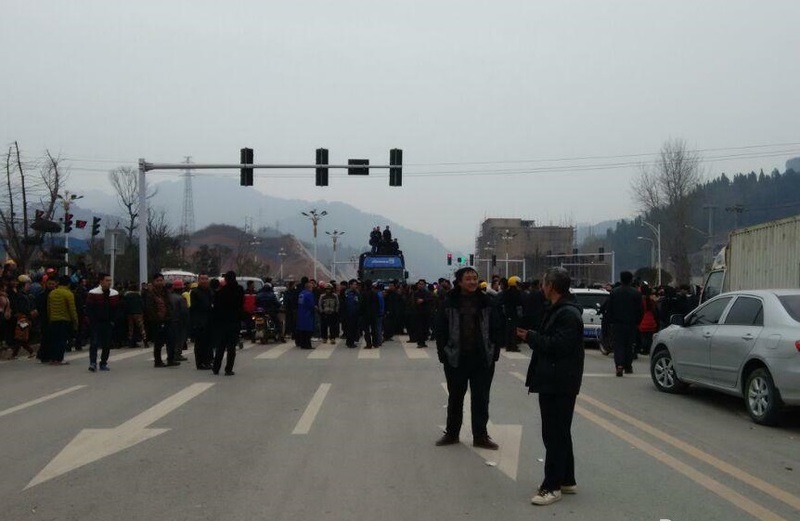 Workers block the road in Yuqing county, Guizhou. Traditionally, worker unrest has been concentrated in Guangdong and the other southeast coastal provinces but protests in inland provinces are now almost as common. For example, it was the central and northern provinces of Henan, Hebei, Hubei and Sichuan that saw the highest number of construction worker protests in the lead up to the New Year, with major cities like Wuhan and Chengdu at the forefront of worker activism. The intensity of worker activism may have tailed-off overall following the New Year surge but in Guangdong’s factories strikes are just as common as ever. There were several high-profile strikes in March in the Pearl River Delta cities of Dongguan and Zhongshan, including a new round of strikes at the Yue Yuen shoe factory, famous for one of thelargest strikes in recent Chinese labour history last year. In the quarter as a whole, Guangdong still accounted for about one third of all the strikes and protests in China’s manufacturing sector. While most of the worker protests in the quarter were in the construction and manufacturing industries, transport and services each accounted for about ten percent of the total. Strikes by taxi drivers made the headlines on numerous occasions, with calls for a thorough shake-up of the industry even reaching the National People’s Congress in Beijing. However as the dramatic attempted mass-suicide in Beijing on 4 April by 30 taxi drivers from the northern border-town of Suifenhe shows, many drivers are still angry and are increasingly desperate. Please note that while there was a dramatic three-fold increase, year-on-year, in the total of number of protests this quarter, 650 compared with 202 in the first quarter last year, this was partly due to more social media resources and better reporting over the course of the year.